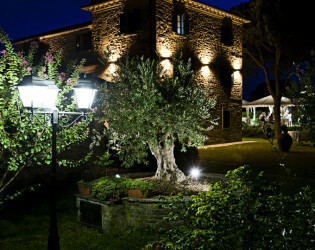 "Under the Tuscan Sun" come to life in a luxury hillside hotel! A late-eighteenth century Italian farmhouse restored with love by the Papi family including an awe-inspiring restaurant in the ancient cellar and perfect pool surrounded by an olive grove, pine trees and a lush garden. Relais La Corte Dei Papi A historic family estate with modern-day stylings, La Corte dei Papi a tranquil Tuscan getaway for gourmands and those seeking a truly unique experience. La Corte dei Papi dates back to the 1700’s and The Papi family has taken great care over generations to preserve the history of the Relais. 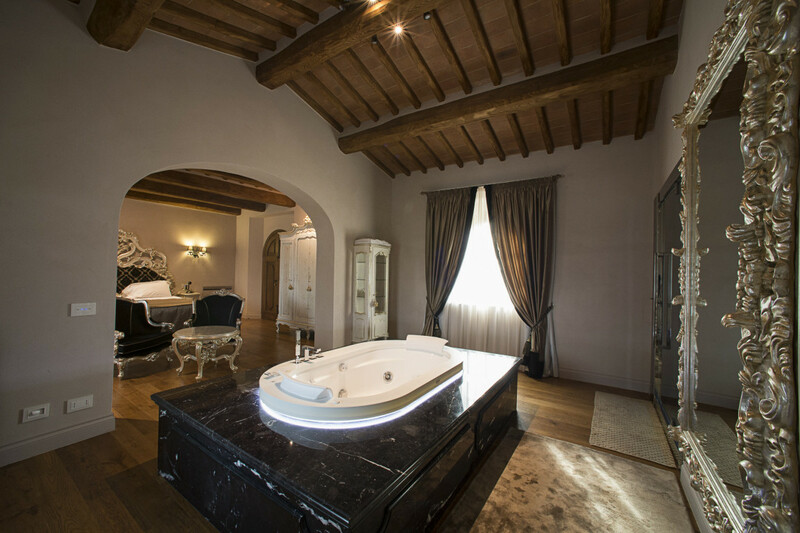 The hotel boasts just 15 suites including beautiful Spa Suites and an excellent restaurant housed in the estate’s original wine cellar. 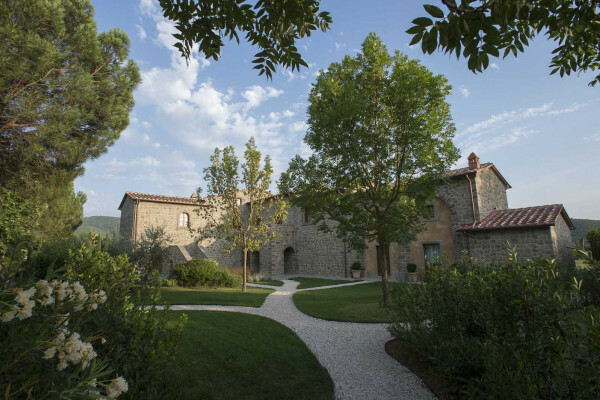 Just six kilometres from Cortona, La Corte dei Papi is situated in the heart of the hills at the border between Tuscany and Umbria. The small, lush, tranquil valley is surrounded by hills of grapevines and a large park rich in flowers, olive trees and pines. All of the interiors of La Corte dei Papi have been lovingly restored to their original splendor, and each of the 15 rooms and suites is furnished with taste and discernment. Modern amenities and complimentary Wi-Fi is provided. Each of the eight spa suites feature a crystal Turkish bath and multi sensory showers with aromatherapy, chromotherapy and music therapy options. 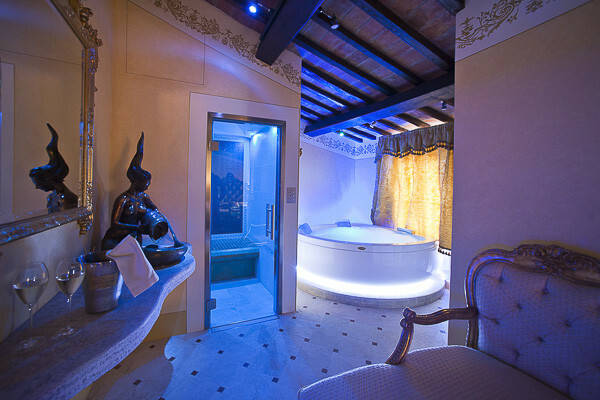 Massages and wellness treatments are done in the privacy of the Suite, with treatments tailored to suit guests needs. 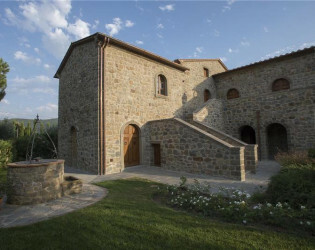 The restaurant is housed in what was the originally the wine cellar of the house and it maintains the integrity of traditional Tuscan cooking with a modern twist. The Chef prepares everything fresh daily including, bread, pasta and desserts. 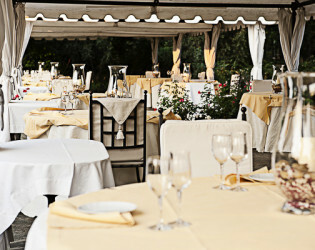 During the summer season dining is al fresco in the gazebos by the pool surrounded by the beautiful garden. The countryside surrounding La Corte dei Papi affords ample opportunities for exploration on foot on bicycle. Professional guides and horseback riding can be arranged. For cooking enthusiasts, individual cooking experiences are offered with The Chef. For true wine aficionados bespoke wine tours and tastings can be arranged in some of Tuscany and Umbria’s most famous cellars. Guests also enjoy the nearby golf courses and shopping. 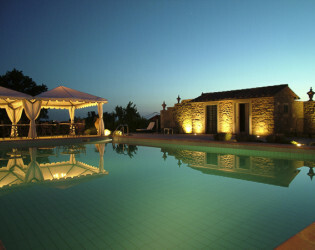 With 15 villas, the property is ideal for a takeover event, be it a wedding or family gathering. 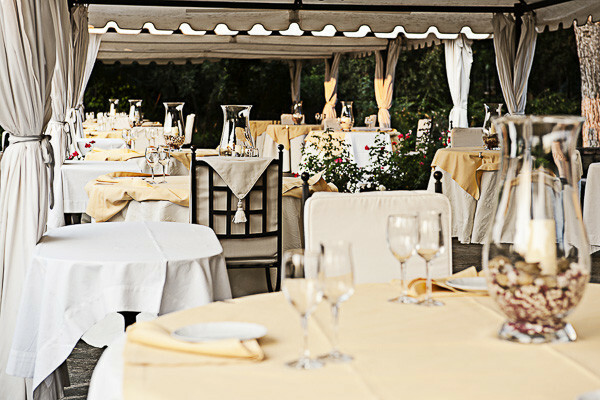 The restaurant of our Relais easily accommodate up to 150 people in a romantic atmosphere around our beautiful pool, surrounded many flowers and colors of our beautiful garden. The prices listed above are not included of the following services: Wedding Cake Drinks Music Open bar Floral decorations Wedding Photographer Limusine services Wedding car We are delighted to organize for your event all the services you may need in order to make as beautiful and unique as possible your event, and offer you an unforgettable experience! 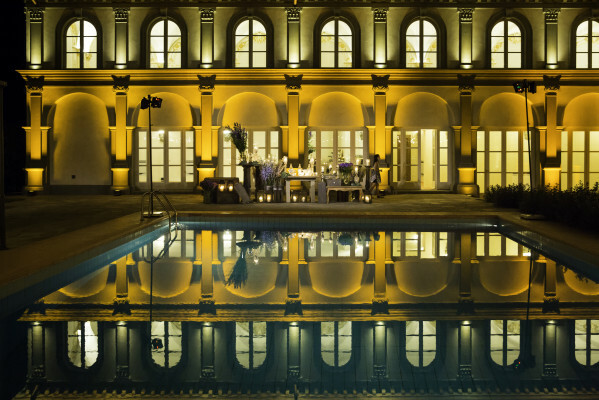 For those who wish to have the exclusivity of our Relais we require to book all our 15 rooms in exclusive use for the event, for a minimum of 2 nights. 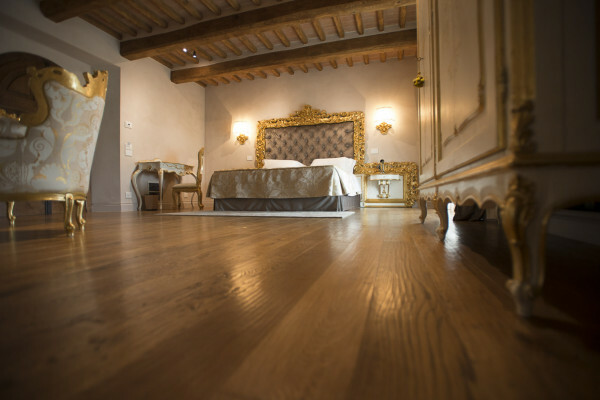 The Relais La Corte Dei Papi provides its guests with 15 classically stylish room and suites equipped with every amenity. The interior has been lovingly restored to its original splendour. Every room and suite is furnished with taste and discernment. The beautiful Spa Suites are dedicated to the balance and well being of guests. A truly unique experience with every imaginable facility to enhance your relaxation, the spa comes to you in the privacy of your suite. our 15 rooms : 2 Deluxe double rooms 2 Deluxe cottages 3 Suite 4 Suite Deluxe Spa wonderful suite dedicated to wellness, with an exclusive private Spa in room , turkish bath with 4 different emotional showers with aromatherapy and chromotherapy with 4 different paths emotional, double Jacuzzi, living room . This Suites very spacious with a size of about 65 square meters each . The suite located on the ground floor has a private garden. 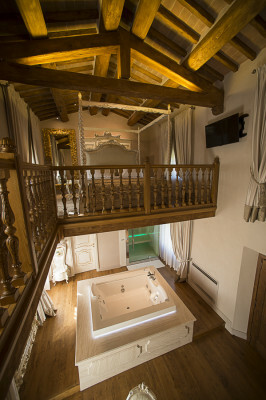 1 Suite Deluxe Spa “La Terrazza” Stunning Suite dedicated to wellness, with an exclusive private Spa in room , turkish bath with emotional shower, aromatherapy and chromo therapy, double Jacuzzi, lounge seating area, and a beautiful terrace overlooking the town of Cortona, solarium and a beautiful gazebo for a romantic dinner by candlelight in the privacy of your suite! 3 Exclusive Suite Spa Splendid Suite dedicated to wellness, are our more spacious Suites with a size of 85 square meters each. This Suites offer an exclusive private Spa in room , turkish bath with 4 different emotional showers with aromatherapy and chromotherapy with 4 different paths emotional, double Jacuzzi, living room . This Suites very spacious with a size of about 85 square meters each . The suite located on the ground floor has a private garden. 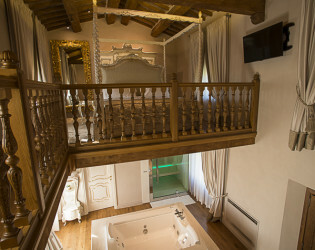 The Exclusive Suite Spa “L’Antico Granaio” is spread over 2 floors, on the ground floor there is the luxury private exclusive Spa with turkish bath, 4 showers with aroma therapy , chromo therapy and music therapy, 4 different emotional paths, double Jacuzzi, a comfortable large living room. The second floor is entirely devoted to the bedroom with a beautiful four-poster bed and a wonderful view to the country side . A private garden. 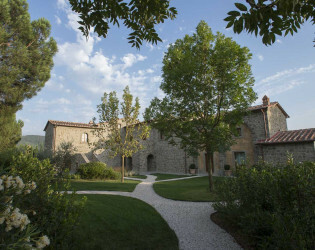 To make your " at Relais La Corte Dei Papi even more special David will be delighted to arrange for you and your guests special activities to rediscover our Tuscany traditions ! - For a special culinary experience, David and his chefs will be delighted to organize for you an unforgettable cooking experience ! You will learn how prepare a 4 course Tuscan menu, and delight a lovely lunch or dinner at our gourmet Restaurant, during which you will enjoy taste the four-course menu prepared by our chefs , and that you have personally prepared during your lesson ! You enjoy to learn how to make various tip of breads, fresh pasta, pizza , Italian dessert and much more! To make your culinary experience even more special .. David will be delighted to accompany your menu with a wonderful selection of the famouse wines! - Do not miss the opportunity to participate to our Wine Tour, a day dedicated to the visit of the most beautiful wineries of Montepulciano and Montalcino, famous for their great wines Nobile di Montepulciano , Brunello di Montalcino and Super Tuscan !!.. always accompanied by our Inglese speaking driver and private guide .. A great experience! - Do not miss the opportunity to experience our luxurious Ferrari and Maserati Tours! Italy is renown for its luxury sport cars such as Ferrari and Maserati, fulfil your dreams we can arrange tours for you. Experience the ultimate excitement and emotions of driving The newest Ferrari and Maserati models. 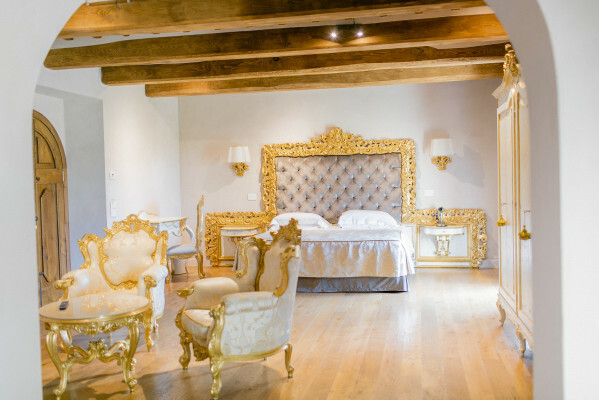 The Relais La Corte Dei Papi is an original late 17 century family dwelling that has been lovingly restored to create a hotel that caters for our guests every wish. An oasis of tranquillity and peace ideal for the discerning traveller who yearns for exquisite Tuscan food in an elegant, charming countryside residence. 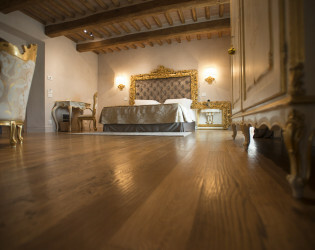 Situated between the beautiful hills that surround the famous historical town of Cortona made even more famous by the writer Frances Mayer in her book “Under the Tuscan Sun” The Relais La Corte Dei Papi provides its guests with classically stylish room and suites equipped with every amenity. The interior has been lovingly restored to its original splendour. Every room and suite is furnished with taste and discernment. 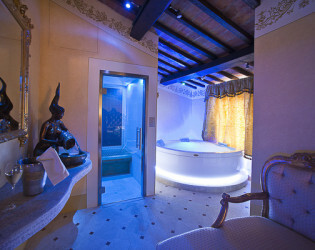 The beautiful Spa Suites are dedicated to the balance and well being of guests. A truly unique experience with every imaginable facility to enhance your relaxation, the spa comes to you in the privacy of your suite. The restaurant is housed in what was the originally the wine cellar of the house and it maintains the integrity of traditional Tuscan cooking. The kitchen recreates the delicate flavours of genuine Tuscan dishes with a modern twist. Every ingredient used in our kitchen is selected for its quality, freshness and flavour; this creates a special experience at every stage of your meal. Our Chef daily prepares everything fresh including, bread, pasta and desserts. 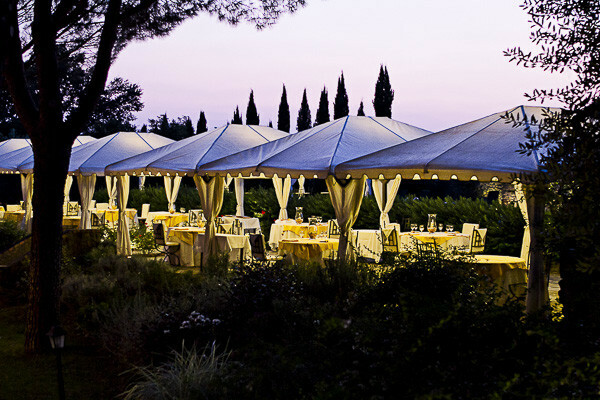 During the summer season our events are hosted in our wonderful outdoor restaurant by the pool, under our beautiful gazebos surrounded by our beautiful garden, in a wonderful scenery and magical atmosphere of the Tuscan countryside. 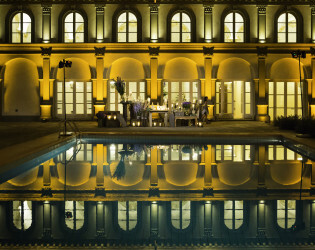 With our Relais in exclusive use for your event you will have all the following at your disposal included : Tables, Chairs, linens, crystal glasses, silverware, our garden where you would be delighted to organize your unforgettable wedding ceremony (is not included in the price everything we will need to hire, following your request) All our menus are preceded by an extensive buffet of appetizers, with combinations of meat dishes, fish and vegetables, joining together tradition and innovation. The buffet is divided into different location, each characterized by a different type of recipes. The buffet consists in a corner with a good selection of cheese, a section of a good selection. Our restaurant "La Corte Dei Papi" is housed in what was the originally the wine cellar of the house and it maintains the integrity of traditional Tuscan cooking. The kitchen recreates the delicate flavours of genuine Tuscan dishes with a modern twist. Every ingredient used in our kitchen is selected for its quality, freshness and flavour; this creates a special experience at every stage of your meal. Our Chef daily prepares everything fresh including, bread, pasta and desserts. 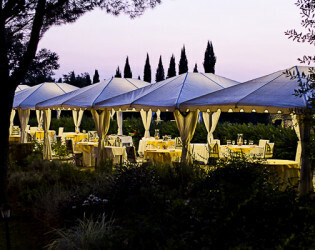 During the summer season our guest enjoy dinning under our beautiful gazebos by the pool surrounded by our beautiful garden. 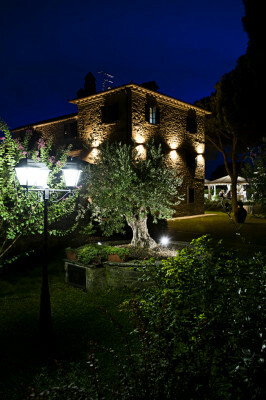 Where you will enjoy the scenery and magical atmosphere of the Tuscan countryside. For cooking enthusiasts we take pleasure in arranging an individual cooking experience with our experienced Chefs who will share their traditional and often closely guarded recipes with you. 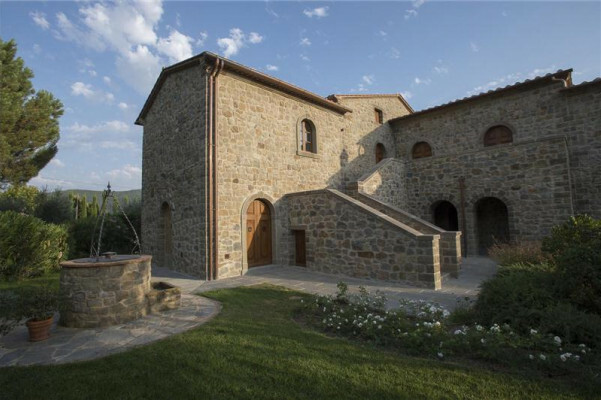 Allowing you to recreate your Tuscan gourmet experience in you own home, delight your family and friends with your authentic Tuscan cooking. Tucked in a small valley amidst the wonderful hills of Tuscany, La Corte dei Papi Relais is a peaceful oasis for world travelers. Those seeking a traditional Italy ambience, as well as incredible cuisine and the comforts of a Tuscan estate, quickly fall in love with this 16th-century country house. Deluxe Spa Suite "La Terrazza"
Dine outdoors with a splendid view over the hills of Cortona. La Corte dei Papi Relais is a peaceful oasis for world travelers.